One of the very best things about this time of year is the stunning variety of greens everywhere you turn. Trees and shrubs are growing their new leaves, and all manner of plants are literally springing up out of the soil. Today I want to share a few of the new green things I came across on my hike – I hope you relish their freshness as much as I did! This distinctive plant, with its lilypad-like leaves and tiny white flowers, is one of my favourite signs of early spring. The plant itself is edible, and has a fresh mild taste. Its common name comes from the fact that prospecting miners snacked on it as they made their way to the coast for the California gold rush – it provided an easy source of vitamin C to prevent scurvy! 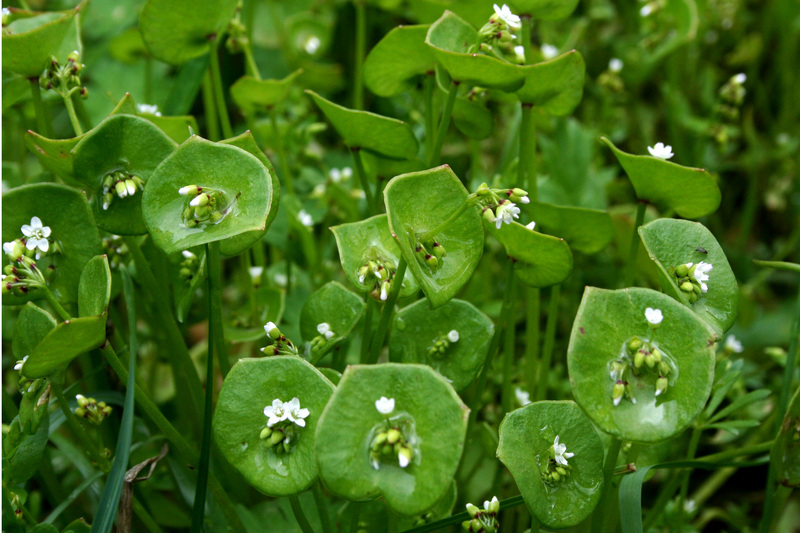 For a lovely account of the historical significance and greographical distribution of Miner’s Lettuce – as well as some suggestions for how best to prepare it – check out Hank Shaw’s post on Hunter Angler Gardener Cook. 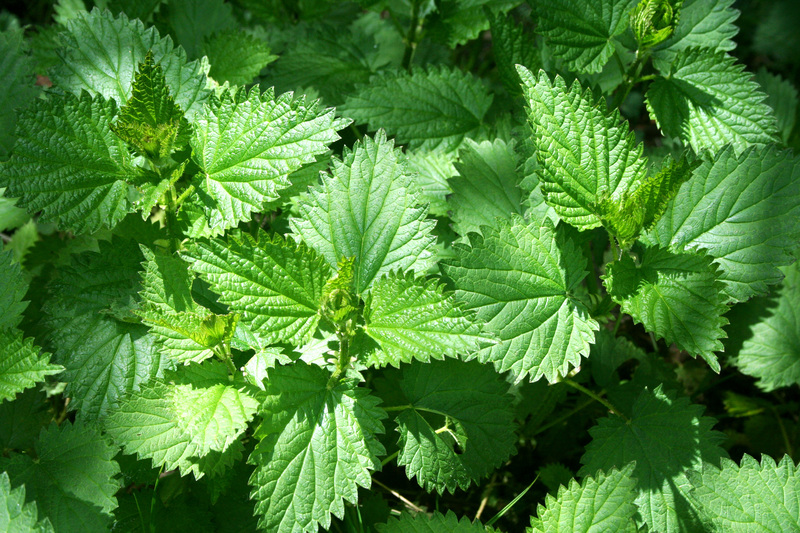 Stinging Nettle is so much more than one of the plants you learn to avoid in Scouts or Guides. Although the fine hairs on the underside of the leaves and stem do contain an irritating chemical that can cause a painful reaction when they come into contact with unwary ankles or fingers, Stinging Nettle also has many medicinal uses. In fact, it has been used for centuries to treat painful muscles and joints, eczema, arthritis, gout, anemia, and to clear toxins from the body. 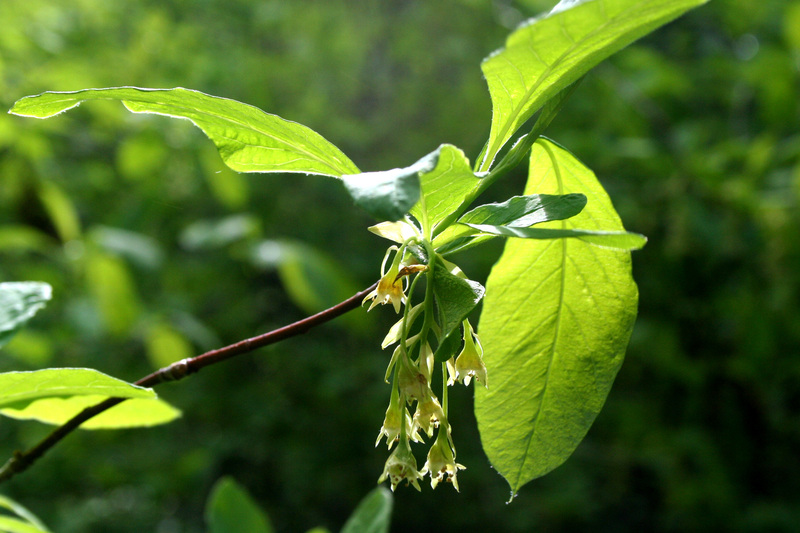 In addition to its healing properties, this versatile plant can be used to craft a strong rope, yarn, and even fabric. Finally, it has also found a place in the culinary world! If you’re feeling adventurous and would like to try out some Stinging Nettle for yourself, there are some incredibly yummy-sounding recipes featuring nettles over at Just Cook It – the Nettle Aloo in particular had my mouth watering! And if you’re hungry for some interesting nettles-through-the-ages trivia, check out The Suffolk Forager. Here on the Island, the vibrant green buds of Indian Plum is the definitive harbinger of spring. Although the ‘plums’ that the plant produces are edible, they are small and pretty bitter – if you’re brave enough to eat too many of them, they can upset your stomach. However, squirrels, deer, and many species of birds seem to enjoy them! Because they bloom so early in the season, they are an important nectar source for hummingbirds, butterflies, and bees. If you’re interested in a full plant profile, the USDA has provided a nicely comprehensive fact sheet. 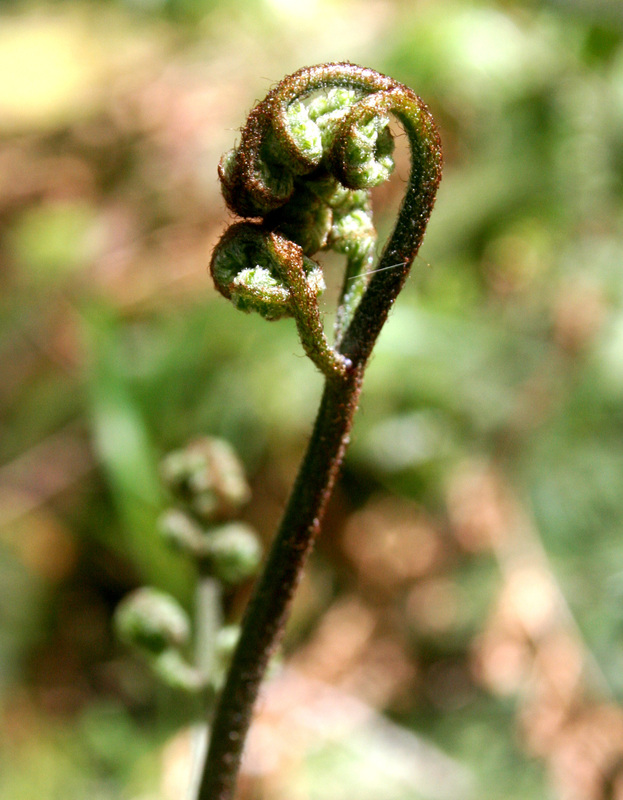 Another distinctive harbinger of spring, bracken fern fronds are a visual representation of the energy literally unfurling throughout the natural world at this time of year. Fresh, green, and tender, these leggy shoots are a promise of the large leafy branches to come, carpeting the edges of forest lands with lush greenery. While today bracken ferns here typically grow not much taller than knee-high, historically they grew much larger in this area. When Sir James Douglas landed at Clover Point near Beacon Hill Park in 1842, he found a verdant landscape – he wrote home with high praise of the area, maintaining that he “delighted in ranging over fields knee deep in clover, tall grasses and ferns reaching above our heads.” Imagine wandering through fields of ferns so tall they provided a shady canopy overhead! For a full account of his initial experience of the area, check out Janice Ringuette’s fascinating Beacon Hill Park History. I’m no moss-o-phile, and thus am not quite certain which variety this is (Oregon Beaked Moss? Perhaps?). Regardless of the exact species, these spindly sprouts marching neatly along above this moss carpet caught my attention, highlighted in the lovely late afternoon sunshine. A quick search (bringing high school biology class screaming back to me for a brief moment) reveals that these stringy little guys are sporophytes, and the teeny capsules on the end hold spores waiting to be dispersed to create a whole new generation of moss. 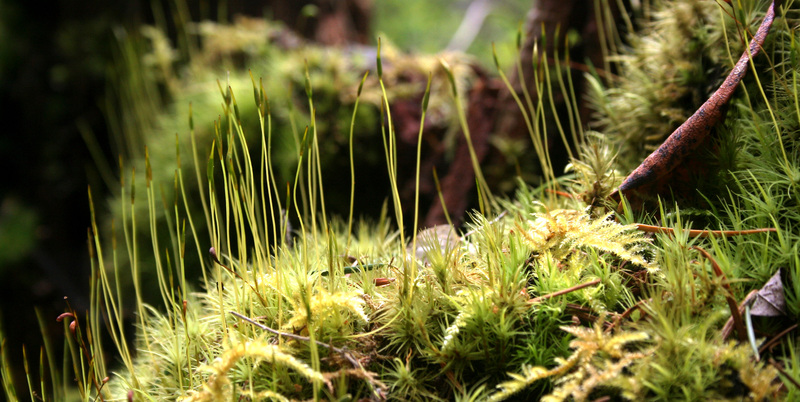 For a lively discussion of the unique characteristics of mosses, visit Vancouver Island Big Trees’ Major Moss post – who knew BC has more varieties of moss than all of the US west of the Rockies!? That wraps up my showcase of Five Very Green Things – here’s to a prolific season ahead filled with various shades of emerald, sage, lime, jade, olive, shamrock, kelly, mint, viridian, laurel, apple, celadon, forest, and of course, spring.